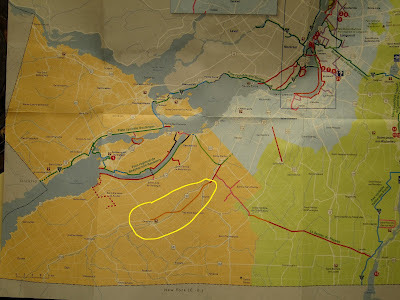 Cycle Fun Montreal: Ormstown-Howick/Ste-Martine bike path now "on the map"
Ormstown-Howick/Ste-Martine bike path now "on the map"
New rail-to-trail bike path is close to Montreal but 100% outside the urban sprawl zone. The new bike path through the Chateauguay Valley is official: it is on the 2012 Monteregie cycling path map. Slight problem: as of today this path isn't built yet. Happily, the non-highway side of the river is perfect for cycling, and in fact is one of the best riverside bike rides in Quebec. This is no BS, we guarantee you. Stay tuned for news of the opening of the 2012 new bike path. This new rail-to-trail bike path is close to Montreal but 100% outside the urban sprawl zone. It is rural countryside in all its aspects. The bike path has got people writing to the local newspaper (The Gleaner) and the latest letter writer says that he won't take the new bike path, because the road beside the river is so pleasant. True, but the bike path opens another option for cyclists to ride safely. We think cyclists will make their first visit here for the new bike path, but they will come back for the infinite variety of nice road rides (long or short, easy or hard, but always beautiful and fun) in this beautiful region. I sure seem to be shoveling it on pretty thick, sorry!